Here’s a cover design I just finished up for author Jane V. Tichenor. Pam is a country girl and has dreams of a simple life. She wants what all the girls in her small town desire: a devoted husband; two adorable kids, a boy and a girl; a playful dog; and a nice house with a big back yard. Jeff is an Army “brat” and has dreams of being a career soldier just like his dad. He is outgoing, handsome, and on every girl’s list as a prospective husband. When Pam and Jeff meet at college, they are attracted to each other but soon discover how different their goals are. Are they willing to give up their dreams to make this relationship work? If they do, will they regret it later? Could their relationship survive? 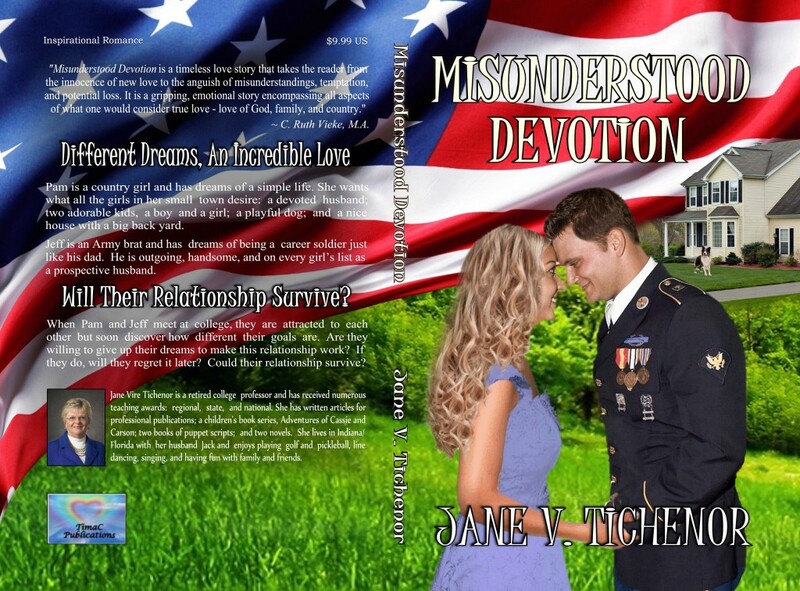 “Misunderstood Devotion is a timeless love story that takes the reader from the innocence of new love to the anguish of misunderstandings, temptation, and potential loss. It is a gripping, emotional story encompassing all aspects of what one would consider ‘true love’ – love of God, family, and country.” C. Ruth Vieke, M.A. “I was hooked on the story after only a couple of pages, and I didn’t want to put it down. I loved the author’s style, characters, and story line. I wanted to read more!” Jamie Hill, B.S. « Lots of new covers this week!